My brother James is a Tour de France fanatic. He’s obsessive about it. So, on one bright June day we set off for Mont Ventoux just because it’s ‘on the tour’. 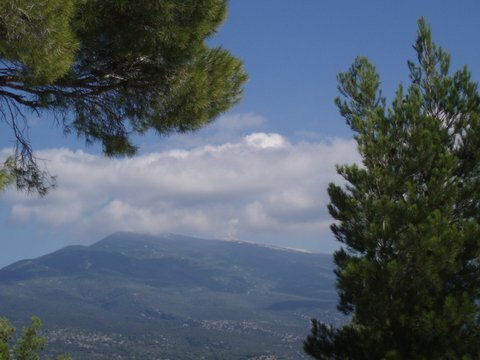 The ascent begins in the small town of Malaucene in Provence and rises steadily. As we drive up I notice numerous cyclists, one on a monocycle, also making the climb. Mad, I thought. The road curves, hairpins and soon leaves the tree line behind. On one side there is a precipice, on the other rock and not much room in-between. I daren’t look either left or right to see the magnificent views. The Observation Station is just below the summit with a parking area. We stop. I get out of the car and the wind rushes through me at storm force, the temperature is North Pole and I’m dressed for a Mediterranean beach. I quickly get back in. My brother goes wandering off to the edge taking photos. I can’t look. I just stare straight ahead at the next mountain. It’s a great big one with a white cap – so that’ll be snow then, I thought. We make the final climb to the summit. I find I’m hanging on to the car door handle. For some reason it makes me feel safe. The logic of this is as off-the-planet as I feel. But I don’t want to fall off the edge, so I keep hanging on. At the summit there’s a cycle-jam. We do a three-point turn in no space, with only oblivion for pavement. We set off again. The road rises and then disappears. All I can see over the brow is blue sky. I throw my arms out as I try to press myself through the back of my seat. My brother just chuckles to himself and drives on slowly. At the heart-stoppingly terrifying moment when we reach the brow I slam my eyes shut…the car hairpins left and continues down the steep slope. ‘I can see where the road is,’ James says. I’m still hanging onto the car door handle and just staring at the car’s bonnet. 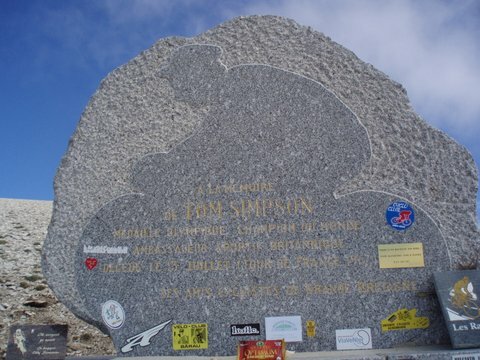 A kilometre down from the summit is the monument to the professional cyclist, Tommy Simpson, who collapsed with exhaustion and died there in 1967. We pull off the road, stop and James gets out, camera in hand. I’ve got the car door handle in my shorts pocket and there’s no way I’m letting go. Soon my brother returns with his photos and a chunk of mountain. 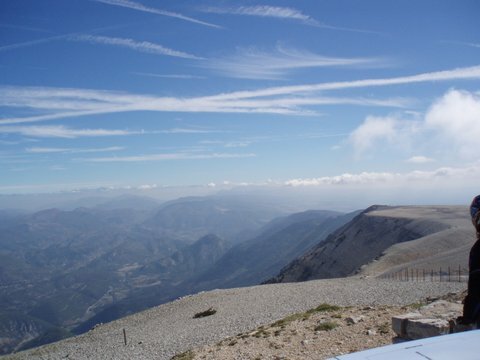 Sharp intake of breath as I realise that the summit of Mont Ventoux is now unsafe as part of it is missing! Cyclists beware! Back on the tarmac again and we proceed down the hairpins and back into the tree line. That’s one of the good things about trees. If you fall off the edge, you’ve always got something to grab as you go careering down the mountainside. Later, firmly settled in my camping chair at just a few feet above sea level, I’m calmer. A refreshing cup of tea and I’m feeling brave enough to pick up James’ camera and look at the photos for the first time – but then, I change my mind.